For all students enrolled in the 5 hr Accredited Barista course an online learning program and a 76-question multiple choice exam needs to be undertaken and successfully completed. These questions are spread over 14 modules. Note: This should not be left to the last minute as this may take 1-2 hrs to complete. Access to your online workbook will expire after 30 days. 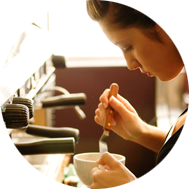 Students enrolling only in the 3 hour Barista Course National, do not need to undertake online learning.